Recently the Australian government denied Todd Bentley access resulting in the cancellation of the Fresh Fire scheduled tour of Australia. Now Fresh Fire USA Ministries is in financial straits and looking for you to $ow a $eed for a$$istance. Our last minute delay in our planned tour to Australia was a huge disappointment of course. It was also a huge financial set back for our ministry. Our immediate expenses just in Airfare and travel was over 10,000…The need is still $20,000. Would you pray with us and consider sowing a seed into our ministry today! If each of you that have been blessed by our ministry over the years would consider a gift at this time we can more than enough recover our shortfall and move forward in 2012. We know that this is a great year of the nations for us. It’s rather curious that not one prophetic minister friend could foresee that Bentley would be refused entry into Australia thereby averting his financial woes in the first place. Were these prophets all sleeping, in deep thought, busy, or travelling [cf. 1 Kings 18:27]? Perhaps Bentley just does not yet have the requisite amount of faith. But I have an idea. In reverse TBN fashion why not just email Todd and ask him to send $200 to you dear reader? Given the purported principle of a 100-fold return, Bentley would subsequently receive his $20,000 with just this one donation! Any takers? Does Becoming a New Creature in Christ Mean New DNA? Should all believers expect impunity from crimes committed prior to conversion? Does this mean that all ‘born again’ (born from above) believers have new DNA? Would a DNA change then be the sure marker of a true convert? Should we believe Damon Thompson and his story? Hey, NOW we’re talkin’! So, Johnson likes jazz and he has a turntable?! My interest is piqued, as I have an extensive collection of jazz records (vinyl) which I still play on a turntable. “We just might be able to have a mutually edifying conversation about jazz,” I ponder. Not too sure about theology though. I wonder – which artists in jazz does Johnson like? Perhaps it’s the spiritual/free jazz of the ’60s such as Albert Ayler, Pharoah Sanders, late-period John Coltrane and the like? Or, maybe he prefers the heyday of Blue Note with such artists as Lee Morgan, Donald Byrd, Horace Silver, Jimmy Smith, etc.? Or, perhaps he likes stuff such as Dave Brubeck, Thelonious Monk or perhaps Duke Ellington? Vocalists such as Billie Holiday, Ella Fitzgerald or Sarah Vaughan? Maybe he’s a Miles Davis fan – but, then which era? Perhaps Miles’ electric era of the late ’60s into the ’70s? Or, how about Sun Ra (born Herman “Sonny” Blount)? Now, Ra had some very esoteric theology to go with his diverse musical excursions. Perhaps he likes more contemporary stuff on the German ECM label, some of which is European although the label includes the music of American Keith Jarrett, among others. Or, maybe this relatively new band Tongues of Fire? Hopefully, he’s not calling stuff like Kenny G ‘jazz’. In any case, this thought process led me to anthologize the Bill Johnson posts here on the site. How did I come to that? Well, record companies tend to anthologize the works of artists in order to acquire a larger audience and, hence, boost sales. Of course, I’m not looking to make any money, but I do want this information disseminated to the largest audience possible. Initially I considered titling the post facetiously “The Best of Bill Johnson”, but I didn’t want to potentially confuse or mislead, lest anyone think I’ve now begun to promote Johnson’s material as if I was like-minded. Alternatively, I pondered borrowing a ploy by RCA Victor used on a Jefferson Airplane compilation titled “The Worst of…”, but I thought some readers would find it too negative or offensive. So, it was decided to use the more neutral “anthology”, with the parenthetical “So Far” a nod to the title of a Crosby, Stills, Nash & Young compilation of the same name. — Bill Johnson’s ‘Born Again’ Jesus, part I which also discusses portions of his book When Heaven Invades Earth in which Johnson discloses his kenotic Jesus and his assertion that anyone against the “anointing” (as he defines it) is anti-christ. — part II shows how close he comes to the Kenyon/Hagin ‘Jesus died spiritually’ heresy in his proof-texts for the ‘born again Jesus’, in addition to his view that Jesus received the “Baptism of/in the Holy Spirit” in the Jordan, plus his (and other) Latter Rain and Manifest Sons of God leanings seemingly not too far from New Age ideology. — Johnson’s and others’ quotes on Dominionism in The Kingdom of God is at Hand, part II, which questions just which kingdom is being promoted. — Bill Johnson’s Library Mandate – a “direct from headquarters” mandate. — Johnson endorsing Bob Jones: Bethel hosting a “prophetic conference” featuring Bob Jones. — Open Challenge to Bill Johnson/Bethel Supporters regarding a specific quote in When Heaven Invades Earth: “Jesus lived His earthly life with human limitations. He laid his [sic] divinity aside as He sought to fulfill the assignment given to Him by the Father: to live life as a man without sin, and then die in the place of mankind for sin. This would be essential in His plan to redeem mankind. The sacrifice that could atone for sin had to be a lamb, (powerless), and had to be spotless, (without sin)” [When Heaven Invades Earth, 2003, Destiny Image, Shippensburg, PA; p 79]. 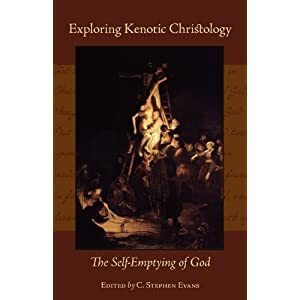 C. Stephen Evans’ compilation of modern essays on kenotic Christology brings together a number of current proponents of the kenosis theory with a few adherents of the historically orthodox view. The essays are written by philosophers, theologians and Biblical scholars all professing Christian faith. Certainly, some strides have been made in attempting to articulate a more coherent (and varied) kenosis doctrine since Gottfried Thomasius first proposed his theory in the mid-nineteenth century. Yet, there are still problems inherent in any literal ‘self-emptying’ and/or ‘self-limiting’ doctrine with respect to the Word (Logos) when compared to Chalcedon and, by extension, Scripture. Confusingly, some use the term kenosis as a way to define the Word’s (Logos’) necessary limitations qua human while neither divesting divine attributes nor limiting the usage thereof during the Incarnation, which is in actuality merely defining Chalcedonian orthodoxy. For example, to claim that Jesus is limited in power yet God the Son is omnipotent is consistent with historical, orthodox Christianity. Yet others in modern times use the term in ways far removed from the starting point of orthodoxy, even going so far as denying pre-existence. Thomas R. Thompson explains: “Kenoticism is now applied to various Christological projects that differ significantly from the intent and strictures of nineteenth-century advocates” [p 102]. Thankfully, the essayists in this volume all affirm the Logos’ pre-existence, though some depart from orthodoxy in other areas. On the more orthodox end, we have scholar Gordon Fee in his working definition as “some form of self-limitation of divine prerogatives on the part of the earthly Jesus” [p 29]. However, others use the term in the sense of either ontological kenosis (the Word no longer retains certain, or perhaps any, divine attributes) or functionalist kenosis (the Word retains all divine attributes yet restricts the usage of some or all). For the benefit of the reader, the type of kenosis will be listed with the explanation of the essayist(s)’s stance in this review – ontological or functionalist (which will also be collectively identified as “unorthodox”), as opposed to orthodox (fully Chalcedonian/Biblical). Not surprisingly, Fee, a renowned exegete, offers the most Scriptural examination of Jesus Christ’s earthly life. He cautions against overly humanizing the divine or improperly divinizing the humanity of the Incarnate Christ, for to do the latter is a sort of “naïve docetism.” Fee does an excellent job of debunking James D.G. Dunn‘s exposition of Philippians 2:6-11 as an ‘Adam Christology’ [30-32]. While not technically kenotic (excepting perhaps a modern understanding of the term), Dunn asserts that the Apostle Paul understood Christ as a man (Adam) rather than the pre-existent Logos who was subsequently made flesh [Dunn, Christology in the Making 1980,Westminster; pp 113-128]. Fee provides a fairly thorough exegesis of the Philippians passage illustrating that the best way to understand the ‘self-emptying’ is metaphorically rather than literally. At times he seems to be propounding a functionalist kenosis , yet it appears Fee is merely explaining the Biblical grounds with which to approach the study of the humiliation of Jesus Christ [the Incarnation from conception to Cross and subsequent burial] to stay within the bounds of Chalcedonian orthodoxy . Fee neither attempts to explicitly debunk any of the historically unorthodox kenosis theories (save Dunn’s) nor fully define his own stance. Bruce Fisk agrees with the logic of kenosis, yet his essay focuses primarily on comparing the Philippians hymn (2:6-11) with contemporaneous Graeco-Roman fiction and how the Christ-hymn might have been understood by first century readers. While interesting in its own right, it sheds only a small to moderate amount of light on the discussion of kenosis in this volume as Fisk, frustratingly, neglects to specifically state his own position. To be fair, he does explain portions of the text by providing some commentary of orthodox scholars with whom he agrees (or seems to agree), with opposing viewpoints as well. Furthermore, to his credit, Fisk touches on the problems in defining the Greek (transliterated) harpagmos [in verse 2:6b – see further explanation in section C of Rodney Decker’s exegesis – updated here] given its limited usage both in Scripture (only one time) and extra-Biblical material, noting that he himself leans toward the view of Moule, Hoover and Wright that Christ “did not regard equality with God as something to be exploited” [63-4]. Ruth Groenhout compares kenosis (self-emptying) in general to feminist thought, arguing that self-sacrifice is not antithetical to feminism: “When placed in the context of a robust notion of self-worth, and when oriented toward service to the Kingdom rather than purposeless self-abnegation, self-sacrifice is an appropriate call for all who call themselves followers of Christ” . She makes a somewhat useful analogy of Christ’s state of humiliation in comparing fairy tale kings who temporarily dress as peasants, setting aside the prerogatives of royalty, who subsequently return to the throne receiving again their full due . Noting that some feminists dismiss Christ’s sacrifice out of hand merely because He was male, Groenhout opines: “His life, death, and resurrection, however, are not intrinsically tied to his masculinity, but to this humanity” . While this is a very profitable essay in its own right, it does little to advance the discussion of the kenosis theory. Thomas R. Thompson provides a useful history of nineteenth century kenosis, discussing various models and their resultant criticisms from the right and the left. In summation, Thompson asserts that any non-kenotic theory devolves into paradox with contradiction (in distinction from merely paradox) which makes ‘classical’ (19th century), or modern, kenosis theories more palatable in comparison. Better, according to Thompson, to accept some paradox “pushing beyond contradiction, if possible”  in explicating a kenosis theory. With this in mind, he claims that the W. F. Gess model (the Logos truly BECAME flesh as a human soul and gradually regained deity throughout the Incarnation – a true metamorphosis of the divine Logos) is “the most consistent and coherent” , while conceding it failed in the claim of deity. Yet incredibly (especially in light of the fact that he’s at least cognizant that the Word was to sustain the cosmos , cf. Hebrews 1:3; Colossians 1:17), Thompson believes this kenotic motif provides the most promise, asserting that a Gessian model can somehow “make the deity claim”, concluding with, “But, that is the argument for another work” . This most extreme of the ontologically kenotic theories has been described by La Touche as “incarnation by divine suicide” [“The Person of Christ in Modern Thought” in L. Berkhof, Systematic Theology, Eerdmans; p 327]. Edward T. Oakes expresses an understanding of the mystery of the Incarnation: “To explain that paradox by saying ‘the infinite has emptied itself to become finite’ certainly resolves that paradox. But if one interprets self-emptying too univocally or too radically, the paradox is not just resolved but abolished” [218-219]. Oakes then proceeds to expound on an essay by Hans Urs van Balthasar putting forth a view that Jesus “descended into hell”, i.e. Sheol, to die there, between the Cross and the Resurrection (which, perhaps to some, could well be a logical conclusion to ontological kenosis, given that Christ took on the sins of the world [cf. 2 Cor. 5:21]). He even seems to suggest that Jesus went to Gehenna, the lake of fire: “Sin is burnt up, as it were, in the fire of this love, for God, as Scripture says, is a consuming fire that will not tolerate anything impure but must burn it away” . To support the view, Oakes/Balthasar use the Apostles’ Creed and much-disputed Biblical texts, primarily 1 Peter 3:18-20, the disparate views of which are aptly described by R.C. Sproul who admits his own view is in the minority: “I would hasten to add that most views of this passage are in the minority, since there is no majority view on the meaning of this text…” [St. Andrew’s Expositional Commentary: 1-2 Peter, Crossway; p 125]. Wayne Grudem explains the various theories related to this passage in the appendix of the TNTC of 1 Peter, taking 37 pages to do so. Neither Sproul nor Grudem construe this passage as remotely kenotic, and Grudem contends the phrase in the Apostles’ Creed (descended into Sheol) is not in the earliest versions of the Creed [Systematic Theology, Zondervan; pp 583-588, cited from Schaff, Creeds of Christendom] and, on that basis, omits it from his systematic [p 1169]. Orthodoxy vehemently denies Jesus literally died in Sheol, much less Gehenna. Not wishing to “abolish the paradox”, Oakes asserts that Jesus Christ was literally the Word ‘become’ flesh [218, 236] (a la Gess, as Thompson proposes above); subsequently, the second person of the Triune Godhead actually becomes wholly separated from the rest of the Trinity post-Cross [similar to the ‘Jesus Died Spiritually’ heresy of some Word of Faith teachers], at which point the kenosis is “subsumed” into the Trinity and the Trinity is “transformed” . Oakes ends his essay with his admonition to “leave the paradox as stark as possible” . In the Thompson/Cornelius Plantinga Jr. chapter the authors assert that kenosis theories are dependent upon the adoption of a ‘social’ view of the Trinity, but one that does not go so far as implicit or explicit tritheism [as Oakes’ essay does so implicitly]. While I’m not so sure that the authors make their case, there are other problematic issues put forth. Again, the Gessian kenotic theory is the preferred model [170, 176]. In speaking of Gess’ view, Chafer aptly describes it thus, “This theory is so untrue…that it needs no minute refutation” [Systematic Theology, Kregel; I.380]. In asking the question “Is kenosis orthodox?”, Stephen T. Davis sets out to ‘prove’ that kenosis can be congruent with the Chalcedonian view that the Incarnate Christ was fully human and fully divine, “I am suggesting a kenotic theory as a way of interpreting Chalcedon” . Davis does not propose a fully formed theory; he merely attempts to show that kenosis (vaguely defined) is orthodox. To counter the charge that a kenosis entailing a ‘laying aside’ or restricting of the ‘omni’ attributes denies divine immutability Davis claims “soft immutability” such that “God is not fickle, capricious, mercurial, or moody; God’s holy and benevolent nature remains ever and eternally the same; God is faithful in keeping God’s promises; God’s aims and intentions for human beings do not change” [135-36]. But how does that square with Psalm 102:27 and Hebrews 13:8, as well as Colossians 1:15-17 and Hebrews 1:3 (and others noted below)? In the introductory chapter it is stated that the Evans/Davis jointly authored closing essay “attempts to draw together some of the main strands made by the proponents of kenotic Christology today” as a challenge to “traditional theories” , with the concluding essay itself asserting that only a “full-fledged” kenosis provides “the best hope of an account of the Incarnation that is genuinely orthodox and yet does complete justice to the biblical portraits of Jesus” . While no specific theory is proffered in the final essay, the authors do claim that Jesus Christ “lived his life in complete and continuous dependence on the Holy Spirit” which, while one could potentially argue that this view is not out of the bounds of Chalcedon, runs contrary to the Biblical witness [cf. John 5:21-25 (Christ acting divinely of and by Himself while incarnate by giving eternal life to whom He chose); John 2:19/10:17-18]. This dependence on the Holy Spirit implies at minimum a functionalist kenosis, but an ontological kenosis can be derived from this as well. In his own essay, Evans promotes an ontological kenosis such that the claim is that if God is omnipotent then to be so necessarily means He should be able to forego His omnipotence. Thinking this through, Evans rightly notes, “If he has given up omnipotence, he cannot use omnipotence to get it back” . Excellent point. Evans, however, explains, “That is why the glorification of the Son is described by Scripture as accomplished by the power of the Father” . While I don’t believe this can be backed up Biblically, there are other problems with this view. Both John 2:19 and 10:17-18 indicate that Jesus was in fact omnipotent as He raised Himself on the Third Day [In fact, the entire Trinity was involved in the Resurrection as other Scripture attests: Holy Spirit – Romans 1:4/8:11; Father – Acts 5:29-31/Galatians 1:1/Ephesians 1:17-20; God – Acts 2:24/Romans 4:24]. Moreover, John 2:11 makes the explicit claim that Jesus performed the miracle at Cana by His own inherent powers which “thus revealed his glory”. Asserting that a kenotic theory should adhere to Chalcedon, Ronald J. Feenstra begins his essay with a brief Christological history starting with the events leading up to and the making of the Chalcedonian Creed. He then proceeds to propound an ontological kenosis by distinguishing between ‘essential’ and ‘accidental’ attributes of divinity, similar to Thomasius’ “immanent” and “relative” attributes. However, as in Davis’ view [Logic and Nature of God, London: Macmillan and Grand Rapids: Eerdmans, 1983; p 124] God is, for example, “omnipotent-unless-freely-and-temporarily-choosing-to-be-otherwise”, borrowing this idea from Thomas V. Morris . In favor of the orthodox view and specifically critical of the unorthodox theories, Edwin Chr. van Driel‘s essay notes the “polemic twist” of the unorthodox kenosis proponents. While classical theologians see the Incarnation as an addition (of a human nature/body), the ontological or functionalist kenotic sees it as a divestment or necessary self-limitation of certain divine attributes instead. Adopting a metaphor borrowed from Marilyn McCord Adams, van Driel calls the divine nature of the Word a “power pack” with the human nature acquired at the Incarnation an additional “power pack”. Thus, the incarnate Christ had two complete “power packs” in one person. Van Driel believes a satisfying kenotically orthodox account can be found in Chalcedon, keeping in mind Constantinople III (AD681) which further specifies a two-willed (and, van Driel construes, a two-minded) Incarnation. While I will agree with the following statement in the Davis/Evans jointly-authored final essay that “Christology is THE Christian doctrine” , I do not agree with their kenotic conclusions on this all-important subject. In fairness, however, the authors state just before their concluding remarks: “We believe that the challenge of kenotic theory will be helpful even to those who eventually reject a full kenotic theory. For a kenotic account will stimulate those who reject it to think more deeply about the meaning of the Incarnation and do more justice to the full humanity of Jesus” . I don’t disagree, as there are those who lean more towards divinizing Jesus’ humanity. One must keep both the human and the divine natures in proper balance/tension. This book mostly fails to fulfill its billing as from the back cover: “It is an attempt to make sense of the traditional [i.e., Chalcedonian; pp 1-2] Christian claim that Jesus of Nazareth was both human and divine by developing the idea that to become human God the Son temporarily emptied himself of some of his divine attributes.” The reason it falls short is two-fold: 1) the essayists promoting a literal self-emptying fail to take into account the whole of Scripture [primarily Colossians 1:17/ Hebrews 1:3, John 2:19/10:17-18 & John 5:21-25] from which Chalcedon is drawn; and, 2) those who promote (or seem to promote) an historically orthodox view (that Jesus did not literally empty Himself of some of His divine attributes) are in opposition to the back cover’s claim. And, frustratingly, neither camp fully explicates a viable theory, though some (Coakley, van Driel) come closer than others. But this in no way renders the work fatally flawed; rather, this illustrates that whoever wrote the back cover commentary was either ill-informed of its contents or did not think through a proper synopsis. A minor criticism: the book does not segregate those preferring (or seeming to prefer) a historically orthodox position from those who favor modern kenosis which can be confusing as one reads along. All in all, the book is thought provoking both for those of orthodox persuasion and those favoring the more unorthodox kenotic views and is therefore well worth the read for either camp in investigating opposing views. Be forewarned, unless one is well-versed in Christological issues and somewhat aware of the various kenotic theories, this book will be a challenging read (as it was for me) and likely a difficult read in spots. Yet, it is this reader/reviewer’s contention that this volume deserves a close study as a way toward a (re)consideration of one’s own position on “THE Christian doctrine”. Proper Christology is indeed central to the Christian faith. Distortions can lead to heresy, and faulty Christology has negative implications on the Trinity and the Atonement. Full adherence to Chalcedon is imperative, keeping in mind the full counsel of Scripture from which the Creed was codified. Three (maybe 3.5) out of five stars overall for inducing further reflection on this subject.